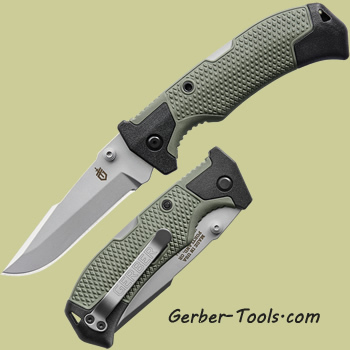 Gerber Edict -Green Folding Knife 30-001300. This popular everyday carry knife utilizes a 3.25 inch drop point blade made with 154CM stainless steel. Dual thumb studs to help open this knife quickly. It has a green rubberized diamond texture handle to help keep a firm secure grip during use. Nice jimping on top and even in the large sized finger groove. Open length of 8.5 inches. Lanyard hole on the end of handle. Silver pocket clip on the back. Proudly made in Portland, OR-USA. Great for your everyday carry and ready to tackle your day's needs. Gerber manufacturer site does have the blade size as 3.6 inches, but this is a misprint, the 3.25 is accurate.